Breakpoints between Sp and Sk-derived DNA sequences. The introgression strains used in diploids 1–8 were sequenced and genotyped for single-nucleotide polymorphisms (SNPs) that reliably distinguish Sk and Sp as in (Zanders et al., 2014). The SNPs flanking the recombination event (left and right boundaries) that generated each breakpoint between Sp and Sk DNA for each introgression strain are shown. The coordinates refer to the position of the SNP on Sp chromosome 3. For the introgression used in diploid 9, SNPs were genotyped via PCR and Sanger sequencing. Raw data underlying Figure 1C. Diploids 1–10 (column 1) were generated by crossing the indicated haploid strains (columns 2 and 4). The diploid numbers correspond to those in Figure 1 and the text. All strains are rec12∆ and transmission of chromosome 3 was followed using heterozygous markers at the ade6 locus (columns 3 and 5). hphMX4 confers resistance to hygromycin (HygR). The number of viable progeny inheriting one or both ade6 markers is indicated (columns 6–8), as are the percentage of the progeny that inherited both markers (column 10). These strains have two copies of chromosome 3, so we refer to them as disomes, although other homozygous disomes could be present in the Ade+ HygS and Ade- HygR classes as well. Amongst the progeny that inherit only one ade6 marker, we show the percent that inherit allele 2 (column 12), which is the allele from the pure Sk chromosome. For the statistical analyses (G-tests), we compared the observed heterozygous disomy and allele 2 transmission to the values observed in diploid 10, which is a pure Sk rec12∆ control (columns 11 and 13). The last column indicates the number of independent diploids that were generated and assayed of each genotype. Generation of mosaic chromosome 3 used in Figure 1B. The goal of these crosses was to generate a strain containing mostly Sp-derived DNA on chromosome 3 in an otherwise Sk background. 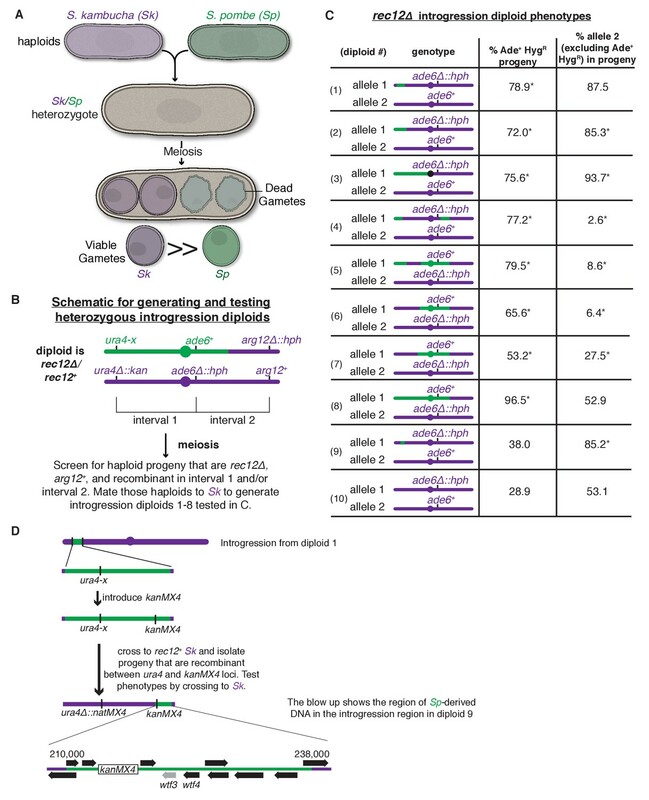 This effort was complicated by the different karyotypes of Sp and Sk chromosomes 2 and 3 (Zanders et al., 2014). We used rec12∆ strains to limit recombination, but rare recombinants (e.g. SZY239 and SZY247) can still be obtained via selection. Markers derived from the Sk parent are shown in purple, while Sp-derived markers are green. 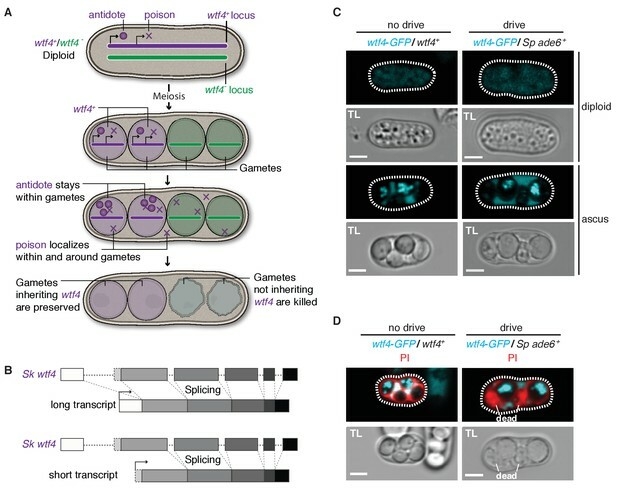 We first isolated hybrids in which Sk and Sp markers on chromosomes 2 and 3 were uncoupled, suggesting rare recombination events had occurred between Sk and Sp chromosomes 2 and 3. Such events have the potential to generate chromosome 3 variants with mostly Sp DNA, but with an Sk karyotype, as occurred in SZY247. We then performed the illustrated crosses to move that chromosome into a different strain background with pure Sk chromosomes 1 and 2. We finally sequenced SZY558 and verified the strain has Sk chromosomes 1 and 2 and Sp DNA on chromosome 3 until between SNPs at positions 1,804,477 and 1,810,659. PI staining correlates with viable spore yield as a measure of fertility in wild-type and wtf heterozygous crosses. The fertility of the indicated diploids was assayed using both the established viable spore yield assay and by PI staining. We avoided tetrad dissection because we found that it was complicated by disintegration of spores destroyed by drive. 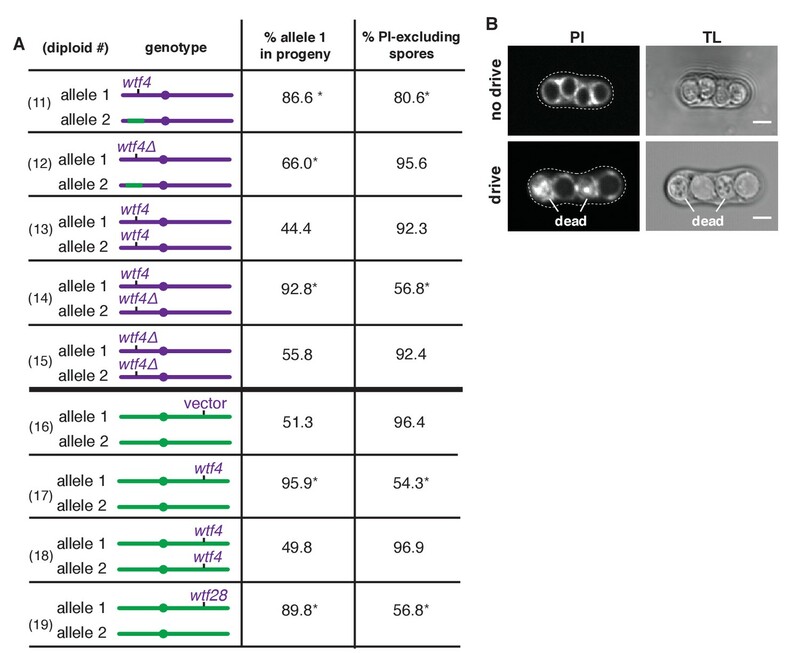 The viable spore yield assay is a plating assay that measures the number of viable spores produced per viable diploid induced to undergo meiosis (Smith, 2009). PI is excluded from viable spores, but enters those destroyed by wtf drivers (Figure 2B). Although PI staining likely will not detect spore death by other causes that do not disrupt membrane integrity, the percent of PI-excluding cells correlates with viable spore yield in wild-type and wtf heterozygous crosses. Diploids of four genotypes are shown. Three of the diploids are used elsewhere in the paper (diploids 17, 22, and 27) and the diploid number (column 1) corresponds to the diploid numbers used in the main text and figures. The two strains that were mated to generate the diploids are shown in columns 2 and 4. The drive-relevant genotypes of these parental strains is shown in columns 3 and 5. The last two columns show the PI-staining and viable spore yield phenotypes of each diploid. Sp wtf4 has alternate transcriptional start sites. 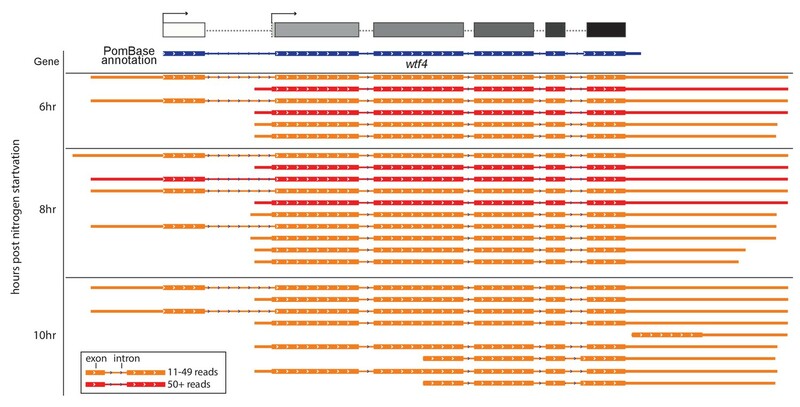 Our annotation of the wtf4 gene with alternate start sites predicted is shown at the top in the same format as Figures 3–5. The PomBase annotation for Sp wtf4 is shown below that in blue. The transcript locations from one replicate of the meiotic transcript time courses sequenced by Kuang et al. (2017) are shown below in red and orange. The IsoSeq consensus reads shown should represent full-length transcripts, and each represents a number of individual sequencing reads. Only transcripts represented by 11 or more reads are displayed. Many of the transcripts vary by only a few nucleotides at the 5’ or 3’ ends and appear identical in the image. The time the samples were taken after meiotic induction are shown on the left. No transcripts with 11 or more reads were observed at earlier time points. Introns are represented by thin lines with blue arrows and the coding sequences are represented by the thick boxes. There are two major transcriptional start sites and the splice sites of intron 5 are different from those in the PomBase annotation. We did not verify two possible additional transcript types observed only at 10 hr, or explore their possible functional relevance. The data were visualized using IGV (Thorvaldsdottir et al., 2013). Spectral unmixing verifies true signal. Wtf4 poison (cyan) and antidote (magenta) protein localization in a mature ascus processed using linear unmixing [top] and unprocessed [bottom]. Scale bar represents three microns. Publicly available at the NCBI BioProject database (accession no: PRJNA376152). Publicly available at the NCBI Gene Expression Omnibus (accession no: GSE79802). Raw data of allele transmission from Figures 2–5. Each horizontal entry represents the relevant genotype and allele transmission of the indicated diploids. The first column represents the diploid number, which matches the numbers shown in Figures 2–5. 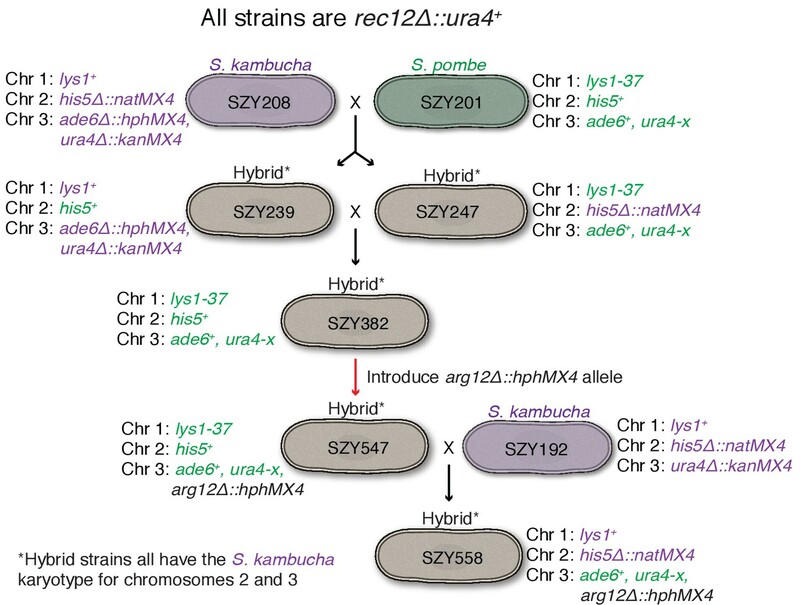 In columns 2–5, the two haploid parent strains (SZY#s) are indicated as are the alleles contributed by those parent strains at the experimental locus monitored for drive. Alleles derived from Sp are green whereas those from Sk are purple. For diploids 11–15, transmission of the wtf4 locus was followed using alleles of ura4, which is fortuitously closely linked to wtf4. Columns 9 and 10 indicate which phenotypes were followed at the drive loci and the number of progeny that displayed each phenotype. Some progeny inherited both alleles at a given drive locus and when the markers were codominant we could detect those disomes. The number of those disomes, which are likely heterozygous diploids or aneuploids, are shown in column 11 and their overall frequency is shown in column 12. If we did not have codominant markers, columns 11 and 12 are filled with ---. Column 13 is a measure of meiotic drive. It shows the fraction of the non-disomic progeny that inherited allele 1 (column 3). Column 14 shows the total number of progeny assayed for each diploid and column 15 is the p value calculated from a G-test comparing the allele transmission of allele 1 to a control. Diploid 13 served as the control for diploids 11, 12, 14 and 15. Diploid 16 served as the control for the rest of the diploids. Columns 6–8 are internal controls for each diploid. 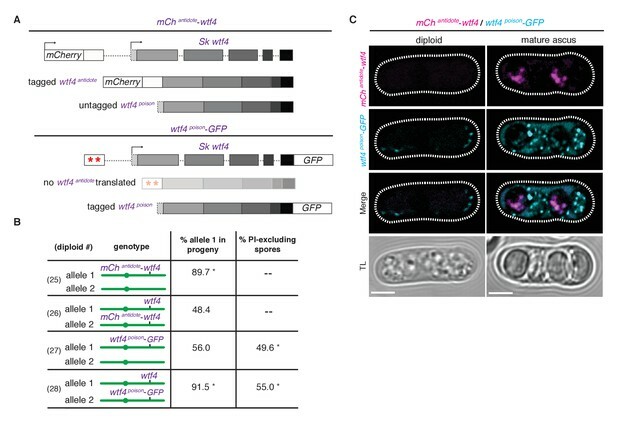 These controls represent an additional heterozygous locus unlinked to the meiotic drive locus that should undergo Mendelian allele transmission. The lys locus is lys4, the ade locus is ade6, and the ura locus is ura4. The final column indicates the number of independently generated diploids that were tested for each genotype. Raw data for PI-staining phenotypes from Figures 2–5. Each horizontal entry represents the relevant genotype and allele transmission of the indicated diploids. The first column represents the diploid number, which matches the numbers shown in Figures 2–5. In columns 2–5, the two haploid parent strains (SZY#s) are indicated as are the alleles contributed by those parent strains at the experimental locus monitored for drive. Alleles derived from Sp are green whereas those from Sk are purple. Columns 6 and 7 indicate the number of spores that stained with PI (dead spores) and those that did not (likely living spores) and column 8 shows the percentage of spores that did not stain with PI. Column 9 shows the number of stained asci that were scored for each diploid type. Spores not contained within 4-spore asci were not scored. Column 10 shows the p value from a G test comparing the number of stained and unstained spores for each diploid to a control diploid. Diploid 13 served as a control for diploids 11, 12, 14 and 15. Diploid 16 served as a control for all other diploids. The number of independently generated diploid strains that were tested is indicated in the last column.